Stomach cancer refers to cancer happened in stomach, which originates from epithelium mucosae cells on top layer of stomach wall, and can be happened in any parts of the stomach (the most common is on sinus ventriculi pylorus area, followed by fundus cardia area, least on body of stomach), and can also invade into stomach wall of different depth or different width. The annual incidence of stomach cancer is about 0.000176; there are high incidence rates in Japan and Denmark, while American and Australia are relatively low in incidence rate; meanwhile, the incidence rate of male is higher than that of female, and it is about 3:1; the peak age for incidence is among 50-60 years of old. 4. Immunity factor: people with lower immunity shall have higher risk of stomach cancer. 6. When eating food that is relatively coarse and hard to digest, chew it and swallow it carefully and slowly. 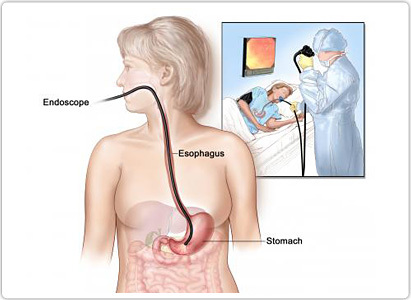 Stomach cancer is a malignant cancer with high incidence and death rate. In order to control it and offer people a health life, medical workers contribute to studies of stomach cancer treatments and have gained important breakthrough. Therefore, stomach cancer patients should keep a nice mood and positively cooperate with doctors for treatments without worry, then better cure effect can be acquired. 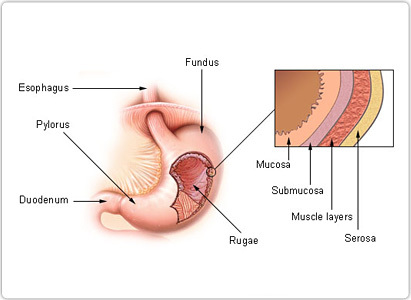 Generally treatments would be different according to the stages of stomach cancer. Usually radical excision is given to the stomach cancer patients in stage I andⅡand after that would be biological treatment. The only difference of treatments between these two stages is chemotherapy won’t be given to the stage I patients, but would properly perform on the patients from stageⅡaccording to post-operative condition. Radical excision, such as external stripping and excision of omental bursa would positively apply to patients of stage Ⅲ. To the patients who cannot have radical excision, palliative excision would be operated and combined with post operative chemotherapy and biological therapy. The patients develop to stage Ⅳ, if their physical condition allow, palliative excision or gastronesteostomy would be performed. Based on the principle of treatments for patients of stomach cancer, stage Ⅳ, chemotherapy, chemotherapy of arterial cannulation and biological therapy normally are applied to these patients. Those traditional therapies work certainly on stomach cancer, but coming with that are poor cure effect and severe side effects. In past few years, many new treatments were developed and applied clinically, among them there is minimally invasive treatment for cancers, an extensively used cancer treatment in 21 century. Minimally invasive treatment includes Ar-He knife, particle implantation, interventional therapy, radio frequency, photon knife, cellular immunotherapy and so on. Based on patient condition, selectively use different therapies can control tumor, improve immunity and life quality of patients while it can also reduce the risk of cancer recurrence and spread. By inserting the freezing probes in minimally invasive way into tumor, Ar-He cryothearpy can freeze tumor cells to minus 160 centi-degree within several seconds while later it can rapidly increase the temperature to 40 centi-degree. In this way, it can kill cancer cells effectively without affecting normal cells. Particle implantation is under the guide of CT or ultrasound B, use special apparatus to implant the 125 I particles, a particle can radiateγray constantly, inside tumor. Then cancer cells would gradually die for the constant radiation ofγray. Radio frequency ablation kills and melts tumor in physical method that under the imaging guidance to insert the heat generator into tumor. Cellular immunotherapy stimulates the tumor immunity of stomach cancer patients through transfusing the immune cells with antineoplasmic activity to treat the tumor. All treatments mentioned above are minimally invasive therapies. Modern Cancer Hospital Guangzhou treats stomach cancer in combined therapy, which means to choose and combine different treatments based on patient condition and advantages of each therapy to make up the shortages in treatments. Thus the cancer can be effectively treated, at the same time, the spread and recurrence of cancer can be controlled. In a word, in order to acquire better cure effect, the patient should take examination of stomach cancer to confirm the condition first, and then choose the proper treatment based on examination report.